Melinda is a bestselling young adult author, originally from the midlands, now living on the east coast of England. Her first novel, THE SIN EATER’S DAUGHTER, published by Scholastic in 2015, was the bestselling UK YA Debut novel of 2015, and was nominated for multiple national and international awards. Rights have been sold in 17 countries to date. Her second novel, THE SLEEPING PRINCE was released in February 2016, with the third and final instalment of the series THE SCARECROW QUEEN published in March 2017. 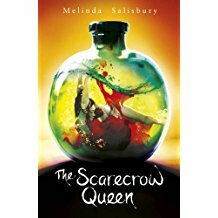 Melinda is also the author of FLAMINGOS, a serialised three part MG story, written for Booktrust’s Letterbox Club project and released exclusively online, and one of seven authors co-writing the novel FLOORED, published by Macmillan Children’s Books, 2018. Her next solo novel, which is as yet untitled, will be released in spring 2018. As a child she genuinely thought Roald Dahl’s Matilda was her biography, Sadly she never manifested telekinetic powers. She likes to travel, and have adventures. She also likes medieval castles,non-medieval aquariums, Richard III, and all things Scandinavian. The Sleeping Prince: Return to the darkly beautiful world of The Sin Eater’s Daughter with a sequel that will leave you awed, terrified … and desperate for more. Ever since her brother Lief disappeared, Errin’s life has gone from bad to worse. Not only must she care for her sick mother, she has to scrape together rent money by selling illegal herbal cures. But none of that compares to the threat of the vengeful Sleeping Prince whom the Queen just awoke from his enchanted sleep. When her village is evacuated as part of the war against the Sleeping Prince, Errin is left desperate and homeless. The only person she can turn to is the mysterious Silas, a young man who buys deadly poisons from Errin, but won’t reveal why he needs them. Silas promises to help Errin, but when he vanishes, Errin must journey across a kingdom on the brink of war to seek another way to save her mother and herself. But what she finds splits the world as she knows it apart, and with the Sleeping Prince drawing nearer, Errin must make a heartbreaking choice that could affect the whole kingdom. The Sin-Eater’s Daughter: Seventeen-year-old Twylla lives in the castle. But although she’s engaged to the prince, Twylla isn’t exactly a member of the court. She’s the executioner. As the Goddess embodied, Twylla instantly kills anyone she touches. Each month she’s taken to the prison and forced to lay her hands on those accused of treason. No one will ever love a girl with murder in her veins. Even the prince, whose royal blood supposedly makes him immune to Twylla’s fatal touch, avoids her company. But then a new guard arrives, a boy whose easy smile belies his deadly swordsmanship. And unlike the others, he’s able to look past Twylla’s executioner robes and see the girl, not the Goddess. Yet Twylla’s been promised to the prince, and knows what happens to people who cross the queen. However, a treasonous secret is the least of Twylla’s problems. The queen has a plan to destroy her enemies, a plan that requires a stomach-churning, unthinkable sacrifice. Will Twylla do what it takes to protect her kingdom? Or will she abandon her duty in favour of a doomed love?